RFA's Dinneen says it will be tough to get ethanol tax credits out of a Congress focused on cutting spending. The overarching message from the 2011 National Ethanol Conference is clear: those wanting to see an extension of ethanol tax incentives need to present a unified front like never before. This year marks the Renewable Fuels Association's 30-year anniversary. 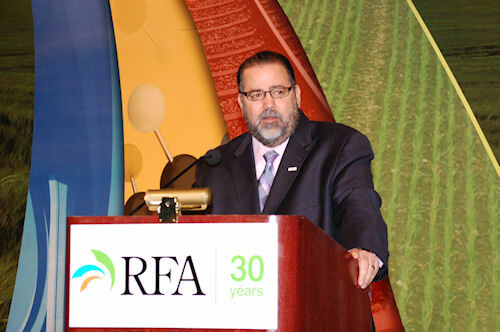 During RFA president and CEO Bob Dinneen's state of the industry address, he took a moment to reflect on past victories, including the monumental passing of the Renewable Fuels Standard. His reliving of glory moments ended with the one-year extension of the Volumetric Ethanol Excise Tax Credit, which is set to expire at the end of this year. From here, the tone turned dour. On the heels of a House vote that overwhelmingly opposed the EPA's attempt to move E15 to the marketplace, Dinneen says it will be tough to win an extension of ethanol tax credits out of a Congress that's primary focus is reducing budget shortfalls. In the midst of a later panel discussion, Cornerstone Government Affairs vice president Mark Rokala summed up the Congress' attitude, saying "It's going to be cut, cut, cut." "Capitol Hill is now being ruled by bean counters," Dinneen says. "The expiration of the tax credit is a very real possibility this year." This leads to Dinneen's take-home message, it's time to unite ethanol supporters. There is no time to put together a wish list, he notes. From the farm to the consumer, now is the time to speak as one voice to keep ethanol incentives in place.